A small mirrored cabinet can compliment any decor without overpowering it. The mirrored finish will catch your eye with its unique presence. The practical size and function of a small chest, works as well in the living room as it does bedside. The pretty mirrored chest on the right features a small size and several drawers and doors for storage. It is sold by a leading retailer for $799. 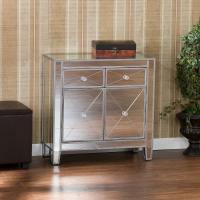 The glamorous mirrored chest on the left also features a small convienent size. It also has several drawers and doors for storage. 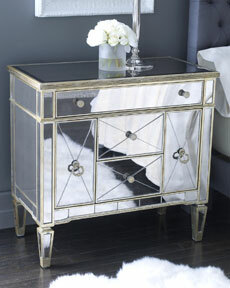 The striking mirrored cabinet on the left is available at www.cheapchicdecor.com for only $249. Why pay more? It pays to be a savy consumer. Careful shopping will allow you to get the same look you are after, for less money. For more great looks for less visit www.cheapchicdecor.com.